Whenever one hears the word ‘Tron’, he has the tendency of thinking of that dreadful sci-fi movie with even worse sequels. But it is high-time to let that ‘tron’ monopoly go and think of something more worthwhile while thinking of the word. 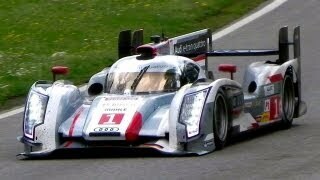 German automaker Audi has come out with a racing car with some outstanding features for this year’s Le Mans event. The car, Audi R18 e-tron Quattro, combines highly-efficient TDi diesel engine along with new generation hybrid technology and Quattro all-wheel drive. Audi first won at the Le Mans way back in 2001 with a TFSI engine and followed it up with another win in 2006 with a diesel engine. 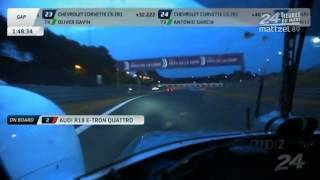 That was the first time a diesel-powered car won at the Le Mans. This time Audi will be fielding four different cars, two of which will be hybrid and other two will primarily be relying on lightweight technology. The hybrid versions have been named as R18 e-tron Quattro and they will make their debut on tracks on May 5 in a race at Spa-Francorchamps in Belgium. These new e-tron quattros has been fitted with what Audi calls ‘next generation all-wheel drive system, where one axle is powered by a combustion engine and another is powered an electric motor. Kinetic energy is recovered on the front axle while braking and it then gets fed into a flywheel accumulator which stores the energy until acceleration is required. Interestingly, the same flywheel accelerator is used by Porsche’s 911 GT3-R Hybrid. Powered by a V6 TDi engine, the e-tron Quattro produces a mind boggling 510 HP and this power is continuously transmitted to the rear wheel of the car. Both these systems complement each other beautifully, but at the same time works independent of each other. The car, which many believe could give the 2012 Audi R18 e-tron Quattro a run for its money, could be the Toyota TS030 Hybrid. But Toyota might have to eat the humble pie at the end of the because of its cheer lack of Le Mans experience, where it has not been involved since the 1990s. All eyes are now set towards Le Mans and people are eager to find out if the R18 Quattro is just talk or is there more to the car than promise. We’ll find out soon. Motor sport is used yet again by AUDI AG to pioneer new technology: the brand with the four ring’s new Le Mans race car is the world’s first LMP1 car to combine a highly-efficient TDI with a hybrid system. quattro drive also celebrates its comeback to the race track with the prototype – in a entirely new form. Audi R18 e-tron quattro is the name of the new Le Mans prototype that makes its race debut on May 5 in the 6-hour race at Spa-Francorchamps (Belgium) and fights for overall victory at the famous 24 Hours of Le Mans (France) on June 16/17. Audi unites two technologies in a fascinating way to create a new type of drive, which is also already being tested for future use in production cars: e-tron quattro. Hiding behind this description is the next generation four-wheel drive with which Audi combines the advantages of the proven quattro drive with the potential of electromobility. To this end one vehicle axle is powered conventionally, the second by electric motors. On the Audi R18 e-tron quattro kinetic energy is recovered on the front axle during the braking phase. It is fed as electric into a flywheel accumulator before being retrieved under acceleration again above a speed of 120 km/h. During this procedure only the front axle is integrated. The V6 TDI power plant producing 375 kW (510 hp) continues to transmit its power to the rear wheels. Both systems complement each other to create the new drive principle e-tron quattro. Audi Sport developed the Audi R18 ultra in parallel to the Audi R18 e-tron quattro – because Audi takes a two-pronged approach this year in the 24 Hours of Le Mans and in the newly created FIA World Endurance Championship (WEC) – the 2012 model year Audi R18 is built with and without hybrid drive. The trick: the base of both cars is completely identical, which is why the additional logistical effort is kept limited for Audi Sport and the race team. The R18 e-tron quattro’s twin brother more than lives up to its model name ‘R18 ultra’: it is the lightest Le Mans prototype that Audi Sport has ever built. To compensate for the additional weight of the hybrid system the subject of lightweight design and construction was the focus throughout development of the 2011 Le Mans race winning R18 TDI. In addition to the many detail optimizations there is also a genuine innovation in the transmission area: a new gearbox with a carbon-fiber composite housing was developed for the R18 – a premiere for endurance racing. Audi Sport Team Joest will field two R18 e-tron quattro and two R18 ultra prototypes in the Le Mans 24 Hours on June 16/17. The two hybrid cars are driven by last year’s winning trio Marcel Fässler (CH), André Lotterer (D) and Benoît Tréluyer (F) as well as Dindo Capello (I), Tom Kristensen (DK) and Allan McNish (GB) who boast a total of 13 Le Mans wins between them. New signing Loïc Duval (F) starts together with Timo Bernhard (D) and Romain Dumas (F) in an R18 ultra as do Marco Bonanomi (I), Oliver Jarvis (GB) and Mike Rockenfeller (D). Audi Sport Team Joest also contests the World Championship round at Spa-Francorchamps (Belgium) on May 5 in the same formation. 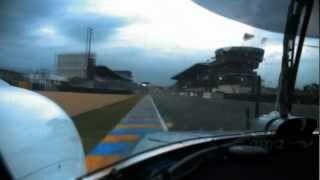 At the same time the race doubles as a dress rehearsal for the 24 Hours of Le Mans. Only Mike Rockenfeller will miss this race due to a clashing date with the DTM. After the 24 Hours of Le Mans, Audi plans to enter an R18 e-tron quattro and an R18 ultra in the FIA World Endurance Championship (WEC). André Lotterer and Allan McNish have been nominated as the drivers so far. At the World Championship opener at Sebring (USA) on March 17, Audi Sport Team Joest relies on the proven R18 TDI from last year, which are driven by Marcel Fässler/André Lotterer/Benoît Tréluyer, Dindo Capello/Tom Kristensen/Allan McNish as well as Timo Bernhard/Romain Dumas/Loïc Duval.